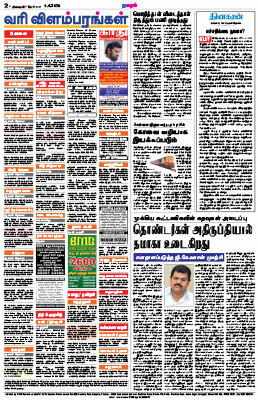 Dinakaran is a Tamil daily newspaper distributed in India. It was founded by K. P. Kandasamy in 1977 and is currently owned by media conglomerate Sun Network. Dinakaran is the second largest circulated Tamil daily in India after Dina Thanthi. It is printed in 12 cities across India. Dinakaran was founded in 1977 by K. P. Kandasamy after he split from Dina Thanthi owned by his father-in-law S. P. Adithanar during the split of All India Anna Dravida Munnetra Kazhagam from Dravida Munnetra Kazhagam. In 2005, the newspaper was acquired from K. P. K. Kumaran by Kalanithi Maran's Sun Network. Dinakaran is published from 12 cities in India namely Bangalore, Chennai, Coimbatore, Madurai, Mumbai, New Delhi, Nagercoil, Pondicherry, Salem, Tiruchirappalli, Tirunelveli and Vellore. As of 2014, the newspaper has a circulation of 1,215,583. In May 2006, Dinakaran published the results of a series of opinion polls which showed politician M. K. Stalin having a greater approval rate than his elder brother M. K. Azhagiri to succeed Karunanidhi as the chief of Dravida Munnetra Kazhagam. As a result, the Dinakaran office at Madurai was fire bombed killing three employees. This led to the resignation of Central Minister Dayanidhi Maran, brother of Kalanidhi Maran from the Union Cabinet.